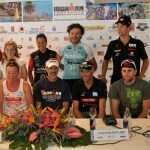 The Lanzarote Ironman 2014 press conference, kicked the introduction of the elite athletes off in its normal cheerful and thorough manner. 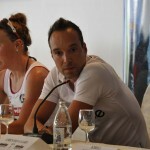 The athletes were introduced to the public and media via Till Schenk, and his usual hope that an athlete would say straight out that they were going to win tomorrow, was again avoided. Such is the challenge of this island event, that no athlete is willing to put their ‘head on the block’ by stating they will win. This just does not happen, the respect of the Ironman event and its distances; from the 3.9km swim to the 180km cycle followed by the 42k run. These are enough to warrant the display only of quiet confidence, throw in the course known as the toughest on the circuit and you have contenders for the title keeping their cards close to their chest. First up, was Lucy Gossage of the UK, coming off a 2nd placing at Ironman Port Elizabeth, South Africa, on the 6th April, last month. The athlete who is a doctor by profession, is hoping for a top 3 finish, so as to qualify for Kona. Her team-mate of the Erdinger Team, is the highly fancied, Sonia Tajsich of Germany, who was bold enough to state she is feeling ready for the tough nature of the course, that the island presents, especially after an injury ridden 2013. She is looking for a win. Throw in her country compatriot and defending champion of Lanzarote Ironman 2013, Kristin Möller, and we sure to have a great marathon duel on our hands, particular after Möller shared that she is happy with her form and feels confident. After last year’s race, she must start as Women’s favourite. Certainly a race to look forward to. A man who has had the ‘lionshare of success’ amongst the 2014 Men’s Elite field, is Bert Jammaer of Belgium, who has won the race in 2008 / 2009 and was 2nd in 2010. He feels he is in with a shout, having spent the bulk of the winter based on the island. He knows the course the best out of his competitors and hopes to be in better contention coming off the bike, after having left himself with too much to do in his pursuit for 5th place last year. 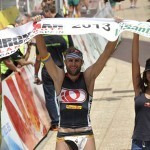 Not many would be disappointed if the likeable Uplace triathlete grabbed top spot. However, there are some who are not looking to be so charitable and he goes by the name of Ronnie Schildknectht of Switzerland. 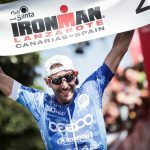 The man who has won the Zurich Ironman, a record 7 times, is known for his Swiss precision to detail and is starting as favourite for the 2014 test. The one athlete who has a chance of going one better is Spain’s Miquel Blanchart, and he comes into this year’s event with a great deal more expectation than last year, when he was able to take a podium finish without much notice in the build-up to the event. The Estonian, Kiri Kotsegarov, is looking to do better than last year, where he grabbed 3rd place while on the run ahead of Phil Graves, and comes into the race more relaxed, after a decent build-up. 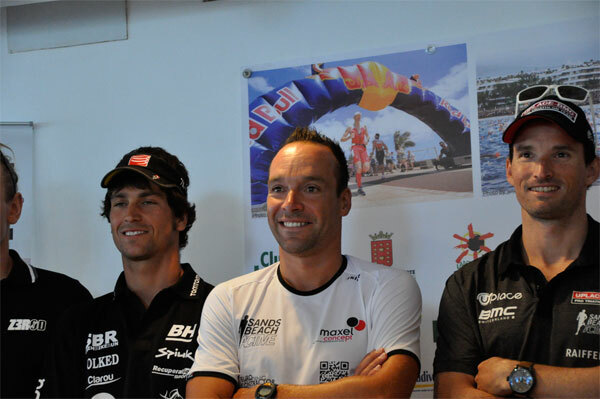 Two more athletes are in the shake up this year, and one is Romain Guilliaume of France. The Frenchman, replaced his coach 5 weeks ago after joining his new team. He is known for being a strong biker and then blowing up on the run. On this occasion, he stated with a smile, that he hopes to take a more cautious approach and to save something for the run. Next up we have the UK’s Scott Neyedli, who like Gossage, won the Wales Ironman with a most impressive performance. The man from Aberdeen, is an enigma of sorts, having retired from the sport and then returning with a fire in his belly. To cap it all, the man knows the course and from this scribe’s viewpoint, he looked to have a twinkle in his eye the more brutality of the course was discussed.